New Planet of the Earth toys on shelves? It's a pre-Christmas miracle! If there's one thing we can credit Trans5mers with doing better than Trans4mers, it's honoring the series' history. Or even paying attention to it at all. See, in Dark of the Moon, the Decepticons invaded and took over Chicago, causing massive destruction and pretty much ruining the city. Then, in 4ge of Extinc4ion (set five years later), the city has been rebuilt from scratch to look exactly the same, and the Decepticons invade/ruin it all over again. It's like that bit in the Futurama pilot where we see aliens destroy the city, it grows back, and then they go back the other way and blast it again. Anyway, Planet of the Earth at least has the decency to leave Chicago a ruined mess, and hints that there are refugees living in the rubble - humans and Transformers. 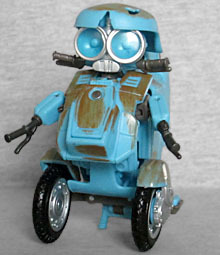 Sqweeks is something wholly inventive and original among the ranks of robots that convert into vehicles: a tiny, kid-friendly character who becomes a scooter! 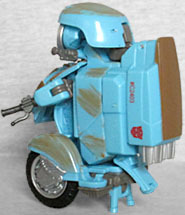 (For the purposes of this sentence, please pretend that GoBots' Scooter and MASK's T-Bob never existed. Also, Transformers' own Sureshock.) With his big round eyes and a vocoder that resembles buck teeth, he looks like a robotic version of the Nerd Face emoji. The crack on his forehead even makes it seem like he's got a dorky bowl cut that's parted in the center! 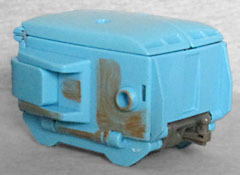 Sqweeks has a rusty, malformed body, though it's in better condition for this toy than it was in the movie. For one thing, he actually has two wheels, instead of one wheel and a peg leg. The shape of the chest isn't right, but they made a valiant effort at including the engine parts you should be able to see there. The body is about twice as thick as it should be, but that's a limitation of needing to convert. His hands are soft PVC handlebars, and the only articulation is a swivel for the head, and a couple hinges and swivels in each arm. During the development of the film, the plan was the Sqweeks would be too damaged to know how to transform, but would keep trying anyway, leading to him getting stuck in weird half-formed shapes. (Naturally, he'd finally manage it properly at the climax of the film.) That bit of characterization fell by the wayside at some point, so in the final product, Sqweeks is just a robot 100% of the time. 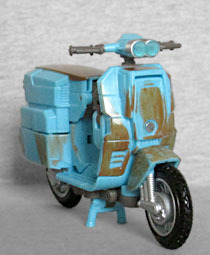 You can tell his altmode would be a Vespa, but you never see it. However, on the toy, you do. Lift the head, spin the chest around, unfold the bock, and turn the wheels to the side, that's honestly about it. There is some fakery going on. 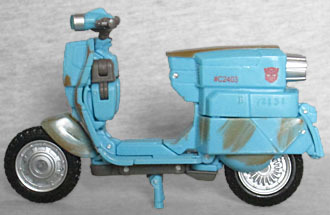 Although his eyes are clearly meant to be the scooter's headlights, they get hidden in the body and a real pair of headlights gets revealed. Similarly, the hands do not become the handlebars - they get removed entirely, while the real handlebars are there permanently. The altmode is apprximately 4½" long and 2¾" tall, putting the scale somewhere in the 5" range - too big for Marvel Universe, too small for Marvel Legends. The wheels roll, the kickstand folds down, and you can even turn the handlebars and the front wheel (separately). 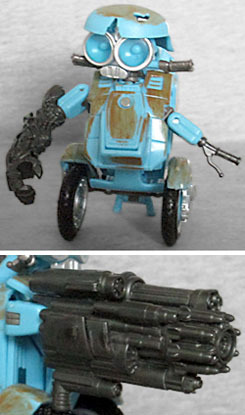 The toy comes with a little trailer that can attach, via balljoint, to the back of the altmode. He didn't have anything like it in the movie, but if we're to go by the example of Hot Rod beccoming Rodimus, then we can only assume that the addition of a trailer means that Sqweeks is the new bearer of the Matrix of Leadership. 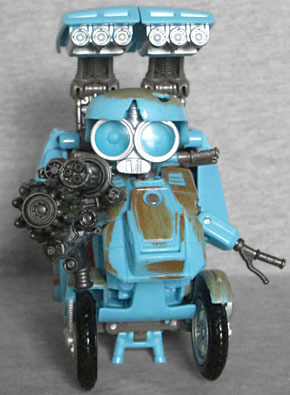 All hail Sqweeksimus Prime! Following the lead of Generation 1 Optimus Prime, Sqweeks' trailer unfolds to a battle/repair platform. 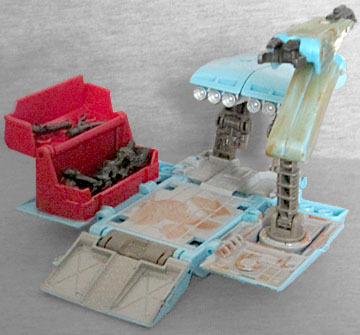 There are lights or missile launchers in the back, a red tool chest on the right side, an articulated arm on the left, and a ramp in the front. The scooter or the robot can sit there to be worked upon. And most of Sqweeks' loose accessories (for instance, his hands) can be stored in there when he's not using them. But that's not all it does! Lift up the cover (the part with the lights/launchers), stand the whole thing on end, and it becomes a backpack Sqweeks can wear. Powermaster Sqweekimus Prime! [I believe you mean "Super God Sqweeksrai" --ed.] Combine this with some of the tiny bot's other features, and you can have yourself one impressive death machine! At one point in the story, Sqweeks gets his arm shot off, and his friend Izzy repairs him by attaching a random Decepticon arm that was laying around. So first, you can remove the toy's right hand and plug the extra arm in there, re-creating that look. Secondly, since it's a Decepticon arm, it can also change into a giant bundle of super-violent weaponry, so the toy also include a second replacement arm representing that. If you want to use both at once, the gun has a handle the Decepticon hand can hold, but that's not as fun. Anyway, combine the Arm of Death with the Backpack of Violence, and suddenly Sqweeks looks ready to take on the world. It's honestly a bit sad the extent to which the makers of Trans5mers thought this little turd was going to be their Groot - the breakout star of the film, ready to be merchandised on everything. There are a couple toys of him, obviously, but also RC figures, masks, dancing MP3 speakers... just tons of junk that no one ever asked for. This is a fun enough figure, if you're lucky enough to find him in a store, but the character is hardly the sensational find the filmmakers clearly expected he was going to be.